Sure, riding in a Hyperloop would be great. But getting your Amazon Prime order from one might make more sense. 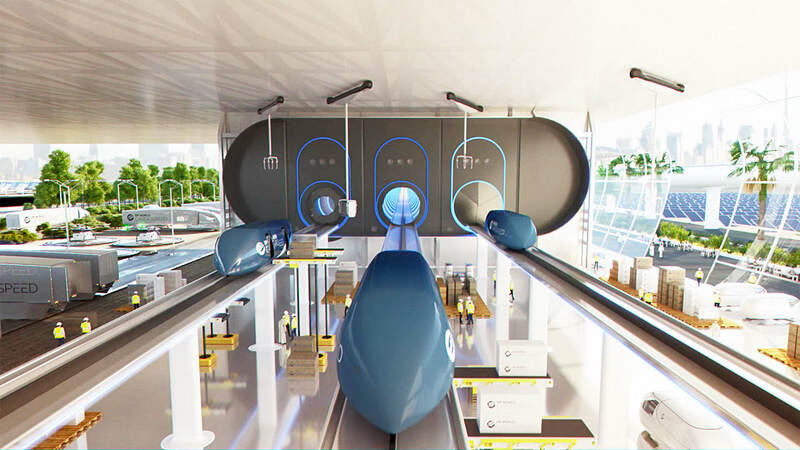 Foster + Partners is best known for its architecture, but the British firm recently created an impressive animated vision for a new type of shipping infrastructure that uses Elon Musk’s Hyperloop concept to deliver packages through tubes at 700 miles per hour. The idea? Use the Hyperloop to transform the shipping industry. There aren’t many details about the plan’s future, but a spectacular video gives us a rough sense of the vision. In it, we see a test run of one of Virgin Hyperloop’s pods, carrying standard shipping containers to the port of Dubai. There, a set of conveyor belts load the packages into Cargospeed pods that launch through tubes that are almost devoid of air, allowing the pods to travel at near the speed of sound using the linear magnetic engines. Finally, a solitary solar-powered drone lands near the house of your dreams, dropping off a package that we can only imagine is full of blue lobsters fresh from the Spanish coast. “On-demand and direct, Hyperloop will deliver exceptional service for high-priority, on-demand goods at the cost of trucking and the speed of flight,” the architects claim. Because that’s the whole point: To satisfy our increasingly impatient Amazon Prime junkie demands in the “I want it now” economy.